MON-333-jr. Monroe posed on a grand piano. Background words are "Club Legend Proudly Presents MARILYN MONROE". Shirt material is a soft and lightweight, 100% cotton, ladies youth/jr size black tee. Shirt measurement across the front if laid flat and measured under the arms: Sm-13, Med-14", Lg-15", XL-16". Length from back collar to hem: Sm-20", Med-22", Lg-23", XL-23". Only Youth / Jr sizes Small left in stock. Marilyn Monroe posed on a grand piano. 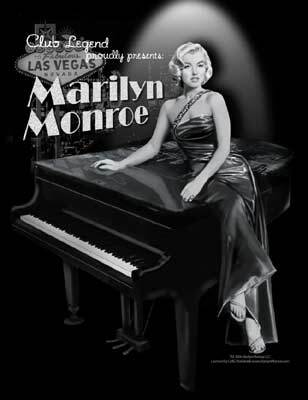 Background words are "Club Legend Proudly Presents MARILYN MONROE".